The University of Central Florida became American Conference Champions Saturday night against the University of Memphis. Memphis outright dominated UCF on all sides of the ball as the Knights suffered from four fumbles and numerous failed conversions while Tigers’ running back Darrell Henderson ran for three rushing touchdowns at least 70 yards each. Memphis put up 24 points in the first quarter and continued the onslaught with 14 more points in the second quarter. But, it would end there for the visiting team. UCF would make crucial halftime adjustments and lock down both the rushing game and passing game while making a complete 180 on offense. Mack, Jr., Adrian Killins, and Greg McCrae revived the No. 7 team to overcome a three-score deficit and take the lead in the fourth quarter. The Tigers succeeded on one field goal attempt in the third quarter but failed to second that attempt in the fourth. The tide turned as the Knights went 35-3 after halftime. Memphis would not come back. The final score ended at 56-41. 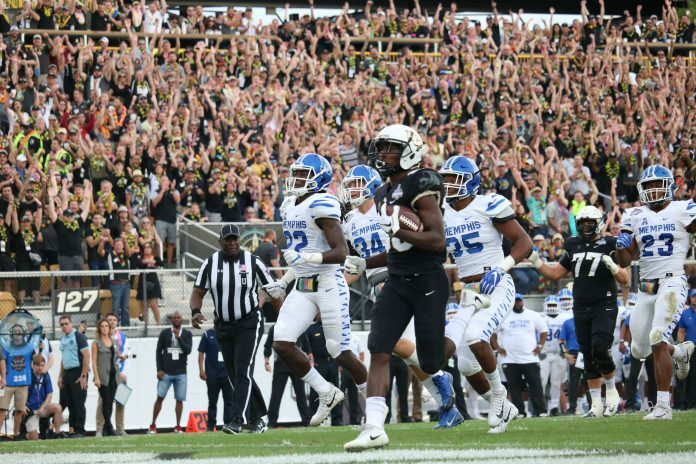 UCF won its second straight AAC Championship, both against Memphis at home to go 25-0 and continue another perfect season. The Knights will likely head to another New Year’s Six Bowl game. Stay tuned for a full game story.